Webwise.ie / Parents / Get informed / Explained: What is Yubo (formerly Yellow)? Yubo (formerly know as Yellow) app is a social networking site where users can make new online friends. Users create an account and swipe left if they want to be friends with someone or right if they would like to pass that profile. 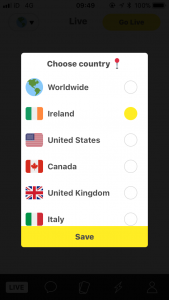 According to media reports the app Yellow came under fire as it was linked to a number of teen sexting incidents in Ireland. It has since rebranded as Yubo. In this article, we explain how Yubo works and address some concerns parents may have around the app. The mobile phone app is free to download. 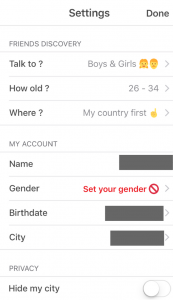 To create a Yubo profile, users must give their first name, gender, and date of birth. Users can then choose who they would like to connect with; boys, girls or both. Finally, users can then upload a profile picture and up to 5 other photos. 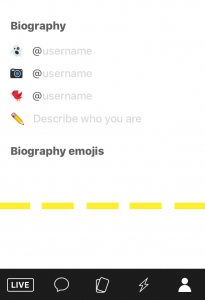 The app encourages users to describe themselves using emoji’s, a feature that may appeal to younger users. The app can be used in your own country or you can choose to make new friends from around the world. You have the option of hiding your city while using the app. Yubo uses location technology to find other users nearby, meaning that if you choose to use the location features, the app will show you other users who are in close proximity to you. This brings up obvious risks for young people sharing their location online. Users can swipe right if they see someone they want to connect with or left if they are not interested. If both users swipe right they are matched and can message each other within the Yubo App. What is concerning about the Yubo app is that it makes it easy for young people to connect with people they don’t know and its design is similar in nature to adult dating apps like Tinder and Bumble. Yubo also now has a Live feature, meaning that users can create a live video with up to four ‘friends’. There are dangers with this type of activity. Users aged 16- 17 and under are only allowed to connect with other users aged between 16-17 years old. However, it is very easy to access the app using an incorrect date of birth. 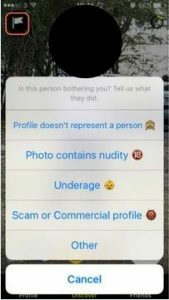 The lack of a robust age-verification tool poses a risk for young users and opportunities for predators. While Instagram and Snapchat are no longer integrated into the site, while conducting our own research, we found that many users upload a picture of the snapchat account details. Users can report other profiles, this can be done simply by clicking on the flag icon in the top left corner of the profile you wish to report. The app will then ask users to select a reason for the report from a list of options. At the time of writing this article there was no clear information available on the Yubo website or in the within the app about terms of service and privacy which is concerning. This is not unusual, as new apps scramble to get out on the market, app creators tend to deal with safety issues as they arise rather than in the design phase. We always recommend reading terms of service and privacy information before downloading any app. It is important for parents to be aware of what apps and social networks their child is using. We would recommend exercising extreme caution with the Yubo app, parents need to consider whether the app is age appropriate for their child. Yubo has attempted to make the site safer, using a number of safeguarding features. Yubo has created two guides to staying safer on Yubo – one for Parents, Carers, and Educators (http://parents-guide.yubo.live/) and one for Teens (http://teens.yubo.live/). The guides provide information about the safety tools available in the app as well as advice about bullying, inappropriate contact, self-esteem and other issues. Yubo also produced guidelines for law enforcement.